Meet and greet, business meeting and election of Board and Officers for upcoming year. devoted to his feathered friends. three-years managing habitat and tracking woodpecker groups throughout the Southeast. involved in projects throughout the tropics educating and aiding small-scale coffee producers about using rainforests in a way that would promote bird habitat and reduce habitat destruction. In addition, Charles worked passionately to reduce the mortality of seabirds by the world’s commercial fishing industry by serving on advisory panels, attending senate hearings and teaching courses in ocean conservation. Charles moved to Rhode Island in 2011 and began teaching at Salve Regina and Roger Williams Universities. 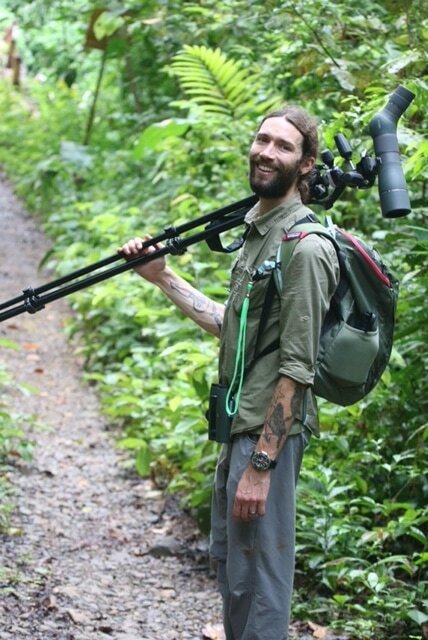 In 2015, Charles was employed as the coordinator for the Rhode Island Bird Atlas, a five-year, statewide project aimed at documenting the distribution and abundance of our birds. In addition to coordinating the project, Charles also serves as a board member for the Audubon society of Rhode Island and The Aquidneck Land Trust and as the co-chair of the Conservation Committee for the International Waterbird Society.